The Orchid Lodge, with its upscale and romantic surroundings, will provide a variety of guests with high quality service. From airport pickups, fine linens and comfortable beds, soft lighting enhancing beautiful views, gourmet foods and wine to small details of nightly turn down services and unforgettable hospitality. The Orchid Lodge boasts 4 fully renovated guestrooms. Each of our room having a unique character, two rooms offer unparalleled privacy and views of our citrus grove, while the other two offer walk-out access to the veranda. All rooms have private baths, televisions and king-sized beds (twin beds available upon request). The great-room offers a comfortable, inviting space to relax and interact with other guests. Television, DVDs, games and a library provide countless hours of entertainment. The 1000 square foot veranda features spectacular views of the Central Valley including San Jose, the Tilaran Cordillera mountain range, and neighboring coffee plantations. Multiple seating areas allow for private relaxation or interaction with other guests. And if basking in the sun is more your style, you can do so while lying along our Infinity Pool/Jacuzzi while taking in all the splendor that our beautiful tropical garden will offer you as you gaze upon the incredible tropical flora and fauna that will astound you! Each morning guests will awaken to the smell of gourmet coffee brewing in the kitchen. They will be able to enjoy a full gourmet breakfast in our dining area where they have the choice of waking up slowly to the day, or sitting at the large table where they will be able to mingle and meet people from all over the world. For breakfast we will serve preliminaries of home baked goods and bread, granola, yogurt, fresh fruit and juices followed shortly by an entree of a sweet or savory dish chosen by the guests the night before. Offering a plethora of activities both nature and adventure based, Heredia is a perfect base camp for tourists coming to Costa Rica. Located at the foot of the Barva Volcano, one of the few volcanoes that tourists can climb, guests are immediately awakened to the beauty that Costa Rica has to offer. The area also boasts the Braulio Carillo and Tapanti National Park which are each packed with wildlife. The Sarapiqui River runs through the province which creates excellent kayaking and rafting excursions. Not to mention that with San Jose only 10k south, tourists have easy access to and from the airport. Our Concierge services will ensure that guests can see Costa Rica in a safe and efficient manner. Working closely with experienced local guides, we will arrange and organize daily tours for our guests using only the most reliable sources. To compliment these excursions, guests also have the option of purchasing home made lunches for the day and returning to a wonderful, sit down gourmet dinner at night when you return! 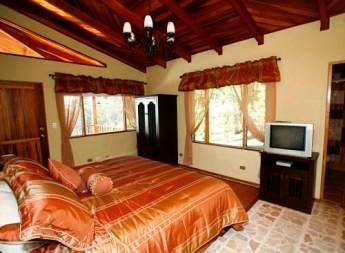 The Orchid Lodge boasts 4 fully renovated guestrooms. Each of our room having a unique character, two rooms offer unparalleled privacy and views of our citrus grove, while the other two offer walk-out access to the veranda. All rooms have private baths, televisions and king-sized beds. The great-room offers a comfortable, inviting space to relax and interact with other guests. Television, DVDs, music and a library provide countless hours of entertainment. Meals are offered either on the veranda or in our spacious dining area, with a picture window overlooking our gardens and picturesque San Jose. Our brand new pool offers guests yet another place to relax and enjoy our beautiful country. Breakfast is included with all accommodations, we also offer gourmet lunch and dinner options! Incredible authentic Spanish restaurant that serves Tapas & Paellas, and offers live music 4 nights a week! *Rates listed are per room based upon single or double occupancy, to include whole house rental with all inclusive meal package. From the Iglesia (Church) in Barva, Heredia continue ~1. 5km North toward San Jose de la Montana. You will pass a coffee plantation (café tal) on the left and then youll see a big blue house, our gate is black, and is directly after the blue house on the left- look for our front wall which is bright orange. There are regular taxis, but using our driver is the best bet!